Crayola has a wide variety of creative paints and paint supplies. Check out Crayola’s washable paint with washability you can trust. The non-toxic paints are perfect for home, classroom, playroom and more. Decorate book covers, signs or posters. Our paints can be used with various brushes, stamps, or sponges to create interesting patterns and designs! 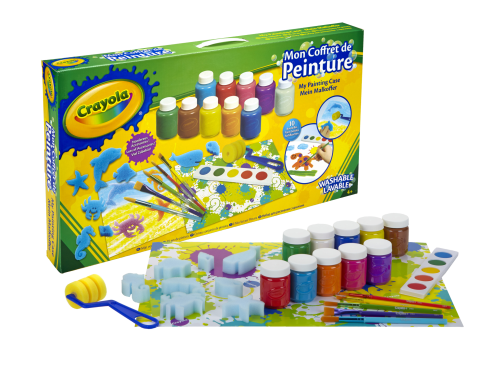 Crayola paint and paint supplies are all designed to stimulate the creative spirit in kids of all ages! All sets of Crayola paints are washable for worry-free creativity and fast clean up. When kids are done for the day, the paints can be rinsed off skin and clothes and wiped from surfaces with a damp cloth. Like all Crayola products, any Crayola washable paint kit is safe and non-toxic. 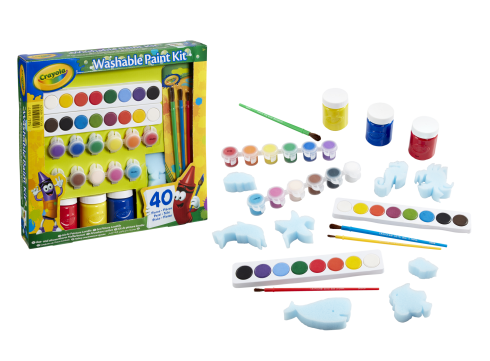 Designed for artists of all ages, it makes a great gift for budding artists who are just learning to hold a brush and paint, as well as those who want to create more challenging, detailed pictures.